Women are more likely to work part-time, and typically earn less - a so-called motherhood penalty. That means the pension contribution change could have more of a noticeable impact in terms of pounds and pence. "This is a little bit of money that goes straight out of my wages before I even see it, that is for the future when I might need it," she said. That is true of Chloe's colleague, Taneika Boyle, who said that she used to be automatically enrolled until she went on maternity leave, returned part-time, and so no longer earned enough to be included to receive her employer's top-up too. "Once you have a baby, you are put to the side," she said. Emma-Lou Montgomery, from Fidelity International, who wrote a report on the financial power of women, said: "We need a system where as soon as women start earning anything they are automatically enrolled, encouraging women to save for their futures." A spokesman for the Department for Work and Pensions said: "The government is committed to removing the lower earnings limit and will consult on the best approach in due course." 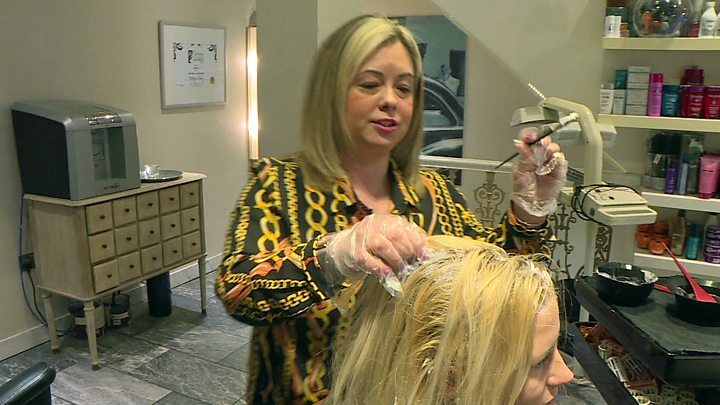 But Martyn Maxey, who owns the hairdressing firm, argued that it was "too big a burden" for small businesses to cover these increasing pension contribution costs, rather than the government. Under the scheme, a 24-year-old earning £30,000 a year should build up a pension pot which would buy a retirement income of about £11,000 a year in today's money, according to Mr Selby, of AJ Bell. This makes a number of assumptions, so the actual result could be significantly different. The final total also depends on the performance of one of a number of pension companies that hold and invest people's savings. Over the past five years, pension pots with Standard Life have gained an average of 4.5% a year in value, compared with those with Nest - the biggest overseer of auto-enrolment pensions - which has seen an average return of 8.9% a year over the same period.